In the last decade numerous developers have tried and failed to place housing on this neighborhood site near Starkweather Creek. All gave up for various reasons, not the least of which are the difficulties associated with building immediately adjacent to a wetland. And recently the regulations protecting wetlands in this area have become even more stringent. Mike Seversin, however, has a personal interest. His family has owned the service station next door for many years. It's a real neighborhood service station, with three busy repair bays. 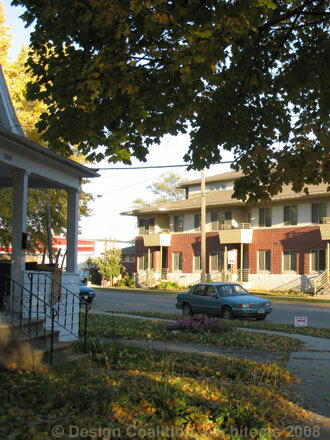 Mike wanted to add a 20-unit apartment building alongside a small carwash annex. He took on the lengthy challenge of gaining approvals from the many governing bodies that regulate the site. In the process, the project won over a vigilant neighborhood association and the Friends of Starkweather Creek, who've called it a model for how development near wetlands should be done. 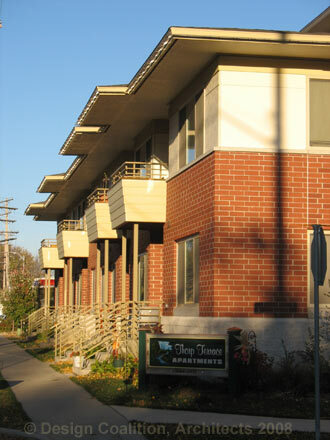 The bulk of the 20 unit building is scaled down by placing only two stories on the street, with entry stoops onto the sidewalk. A stepped-back third story in the rear provides more units with fine views of the wetlands and park beyond. The site design features several stormwater runoff strategies, designed by Schreiber-Anderson & Associates, to protect the wetland. Several nested, man-made landscape features protect the wetlands, including rain gardens, a rock filtration trench and a stormwater detention zone with native mesic-prairie vegetation. These filter stormwater before it enters an undisturbed wetland buffer zone. Under-building parking minimizes on-grade paving. Before granting it's approval, the Regional Planning Commission's report opined that, because of the design of the filtration measures, water quality will actually improve after the development is completed.